This high-res mosaic of 20 images is the first clear self-portrait of NASA's Mars rover Curiosity on the Red Planet. The rear of the rover is at top, with two right-side wheels on the left. The rim of Gale Crater forms the lighter-color strip of the background. Images taken on Aug. 8 EDT, 2012. Released Aug. 17. NASA's now on-duty Mars rover, Curiosity, is on the hunt to judge whether the Red Planet ever had an environment capable of supporting microbial life. The rover's above-the-wheels intellect is designed to mull over the question of Mars' habitability. However, Curiosity will likely stop short of solving the ultimate question: Has there ever been life on Mars? The $2.5 billion robotic explorer, the centerpiece of the Mars Science Laboratory mission, landed on the Red Planet Aug. 5 (PDT), beginning a two-year trek around Mars' Gale Crater. In determining whether Mars is or ever was habitable to life, Curiosity should give scientists a major boost toward understanding whether life has ever existed there, and where to look for it in the future. It's not a new inquiry, but a question that has dogged the "search for life" community for decades. Davila told SPACE.com that if or when Curiosity establishes that it has the capability to detect organics near the surface, "then the focus should turn to understanding the nature and the origin of those organics, and to establish whether they are linked to life." While Curiosity might provide some clues, Davila said scientists would likely need to send a new set of instruments specifically selected to find "biomarkers." A biomarker can be any kind of molecule indicating the existence, past or present, of living organisms. "One option would be to go back to Gale Crater, although my guess is that whatever organics might be there are very ancient and degraded, or non-biogenic — for example, delivered by meteorites," Davila said. Another choice would be to send those instruments to a site where organics should be better preserved and for longer periods of time, Davila added, "such as the ground ice at higher latitudes. We know that similar ground ice on Earth preserves organics and even whole cells for millions of years." If Curiosity does not find organics, Davila said: "This would strongly suggest that neither the dry soils nor the ancient sediments are good places to preserve organics. We still would have the alternative of searching for them in the ground ice, and perhaps in other substrates such as surface evaporates." Some scientists don't doubt whether Curiosity is up for the job. "Curiosity has the ability to detect organic compounds," said Carol Stoker, a staff planetary scientist at NASA Ames Research Center. Similar instruments were also carried on previous NASA Mars landers, the Viking and Phoenix spacecraft. "These missions failed to detect organics, setting lower limits on the presence of organics at very low values," Stoker said. Curiosity's Sample Analysis at Mars (SAM) Suite Investigation is using a better method, "so it may discover organics on Mars that Viking and Phoenix missed," Stoker said. However, that would not constitute proof of life — modern or ancient — because meteorites carry organics to Mars, Stoker added. "Detection of organic compounds has limited relevance to detection of modern life. Curiosity's instrumentation and the choice of landing sites for MSL were optimized for exploring ancient habitable environments, not modern ones," she said. Stoker said that even if there is modern life on Mars, it can grow only where liquid water is available. Therefore, since Gale Crater has no evidence of modern water or ice, life can't grow there, she noted. 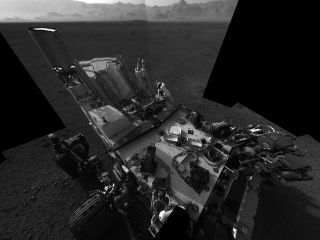 "Furthermore, Curiosity's instrumentation is geared towards characterizing rocks and minerals. Different choices of landing sites and instrumentation are needed to look for evidence of modern life," Stoker said. The prospect that the Curiosity rover might detect organics has been appraised by one former Viking experimenter who worked on the Pyrolytic Release experiment — one of the three life-detection tests conducted on the twin lander missions in 1976. A model of the Viking Lander. Jerry Hubbard, a retired professor of biology from the Georgia Institute of Technology in Atlanta, carried out pre- and post-Viking simulations, leading to his forecast for Curiosity's analysis of soil organics based on Viking biology findings. "I predicted that Curiosity may detect simple organic compounds," Hubbard told SPACE.com. The tests support a prediction that photocatalytically synthesized organics in Mars soil will be found by Curiosity's sensitive instruments, he said. Perhaps the greatest surprise of the decades-ago Viking Mission, Hubbard said, was the failure of its Gas Chromatograph Mass Spectrometer to find indigenous organics in the soils tested. However, the results of the Viking Pyrolytic Release experiment and the supporting science provide a clue as to what Curiosity may well find. Curiosity's "wet chemistry" capabilities, its sensitive gas chromatograph, a Quadrupole Mass Spectrometer and the rover's Chemistry and Camera (ChemCam) instrument package provide new opportunities, Hubbard said, to not only dig into the habitability of Mars issue, but also to decide whether the negative findings of the Viking GCMS could be called to question. "One of the NASA 2012 strategic objectives is 'to determine if there is or ever has been life elsewhere in the universe,' so of course NASA is interested in detecting life on Mars," said Cassie Conley, NASA's planetary protection officer. However, the problem of life detection is a hard one, and not really tractable with in-situ instruments, Conley said. "That's one thing we definitely learned from Viking." Conley said that science works by doing follow-on experiments to answer questions raised by early results, and no mission could carry every instrument needed to make a really definitive conclusion. "MSL is designed as a very capable geochemistry mission, with the objective of understanding surface conditions on Mars — at Gale Crater. The strategy of identifying 'habitable environments' that's used on this mission is a good way to avoid misinterpreting results that will be obtained," Conley told SPACE.com. Returning Mars samples to Earth would allow for much more comprehensive science, Conley said. "Until this past February, we were planning a set of missions with the European Space Agency to do exactly that. Unfortunately, budgetary constraints and programmatic priorities resulted in the cancellation of plans for that set of missions." And there's an additional complication to locating life on the Red Planet. "It's easy to find life on Mars…just bring it with you! The hard part is making sure you could distinguish Mars life, if it's there," from microbes accidentally brought there aboard Earth-made spacecraft, Conley said. There were a number of steps taken on the Viking program, she said, to ensure that Earth life would not contaminate the instruments carried as "life detection" packages. "Ensuring the proper precautions are taken to minimize the potential for such mistakes is one of the responsibilities of my job," Conley said.